Ice is melting and boundaries for economic activities are moving north. Norway’s Prime Minister Erna Solberg argues Arctic oil plays a role in solving global climate changes. “Sometimes maybe we can have both, save climate and create jobs,” Erna Solberg replied to the question from moderator Stephen Sackur at the opening session of Arctic Frontiers in Tromsø on Monday. BBC HARDtalk’s presenter Sackur didn’t manage to have Solberg agreeing that saving the climate means leaving Arctic oil where it is, in the ground. The Norwegian Prime Minister argued that climate gas emission from producing one barrel of oil on the Norwegian continental shelf often is lower than producing the same barrel at a low-cost field in the Middle East. Among the Arctic coastal states, Norway is the one most active on offshore drilling. Simultaneously as stakeholders from around the circumpolar Arctic meets in Tromsø, is the oilrig “Songa Enabler“ at port just outside town. The rig will sail to the Barents Sea in March. To drill or not to drill became the main question in the opening debate at Arctic Frontiers. Jeffrey Sachs, Director of the Earth Institute at Columbia University said investments into Arctic oil would be very wrong for two reasons. “You will waste your money and you will wreck the world,” he said. According to Sachs, the world will eventually move away from fissile fuels and the oil needed will come from Saudi-Arabia and Iran, countries that produces oil for a way cheaper price than can be done in the Arctic. Erna Solberg contradicted Professor Jeffrey Sacks’s arguments saying the oil supply to the world isn’t only a question about lowest production price, but also political stability and diversity of supplies from different regions. Head of Norway’s Nature and Youth organization, Ingrid Skjoldvær, welcomed a broad debate between different stakeholders in the Arctic about how to maintain a sustainable Arctic. Skjoldvær, however, rejects that oil drilling plays any role when managing resources in the north. Ingrid Skjolvær quoted Winnie the Pooh and said you can’t combine saving the climate with drilling for more Arctic oil. “Should the Arctic nations take climate responsibility seriously, we must say no to more Arctic oil production. Green development is about making a choice, and the choice is to say no to solutions of the past and yes to develop renewable industries in a smart way,” Ingrid Skjoldvær says. 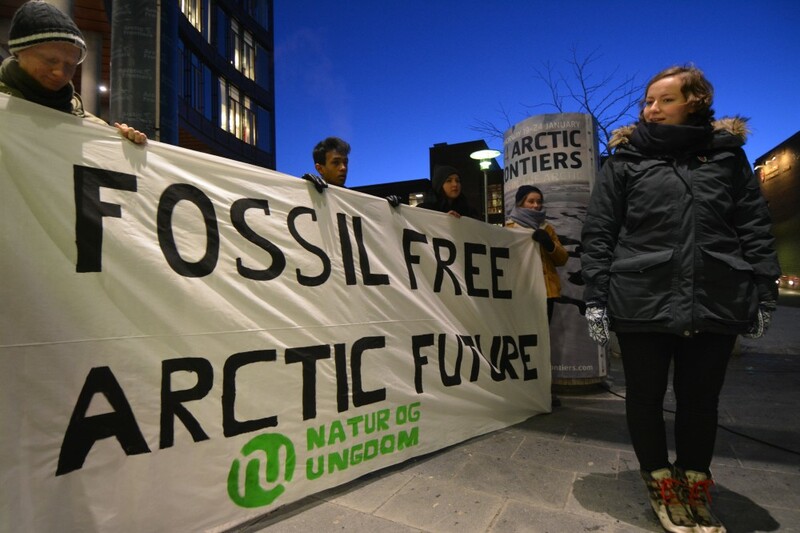 Nature and Youth has together with Greenpeace filed a lawsuit against Norway over Arctic drilling. Prime Minister Solberg said both can be done. “I believe it is possible and necessary to do both.” Erna Solberg, however, underlined the importance of ensuring that present and future activities do not come at the expense of the Arctic environment. “At the same time we must make use of the economic opportunities that are opening up, to the benefit of the 4 million people who live in the Arctic,” Solberg said. 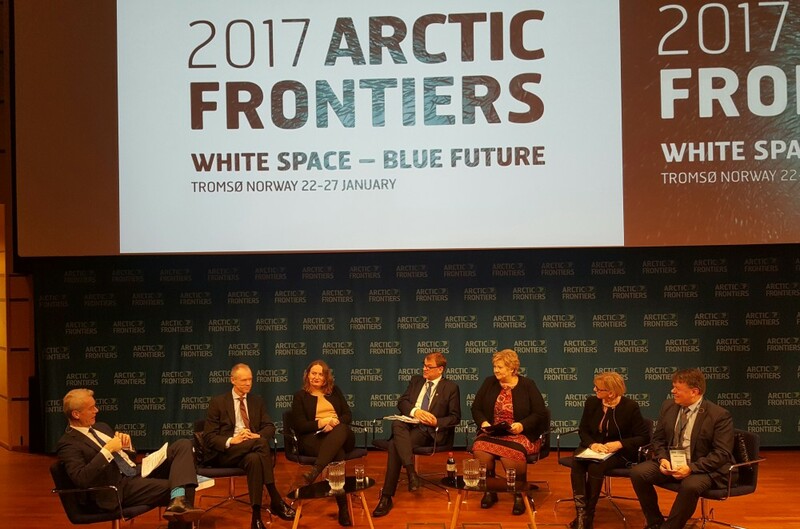 “White Space – Blue Future” is the slogan for the comprehensive program for debates at the Arctic Frontiers that continues throughout this week.